1860, paulownia wood, oiled rice paper, Kang Won Do province. Certified. This stacked chest is made of paulownia wood covered with cut rice paper then oiled. When new, the paper was brightly decorated with paintings which are now muted, the designs hard to recognize. The papered borders seem to be gilded. The simple iron lock-plates and hinges are original. The bottom unit ends with angular scrolled feet. 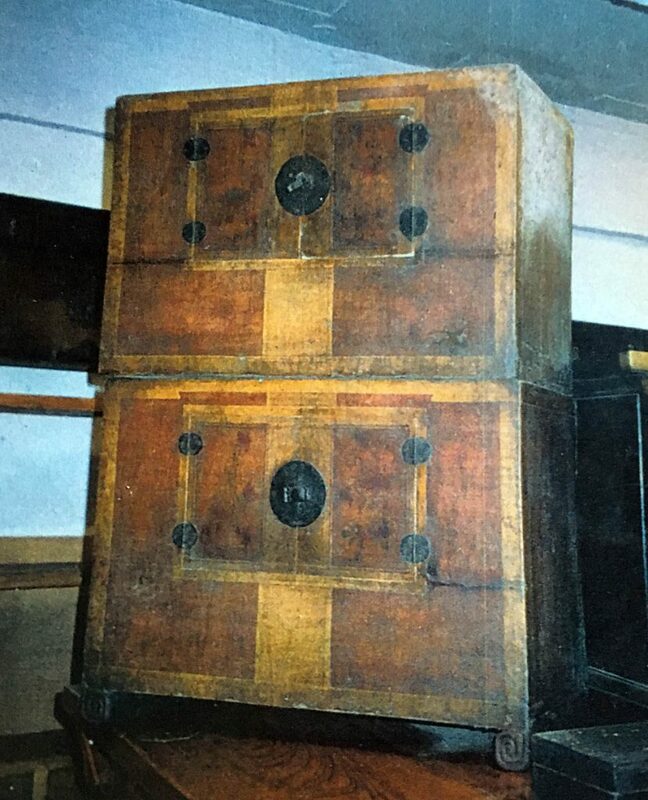 Such a delicatel-looking chest with small doors opening sideways was probably made for women’s quarter to store small clothing items such as socks and clothing wraps. The chest shows a wonderful patina of old age. It is rare and a collector’s item.